Germany has always been the epicenter for good design, and lately the country has produced some truly spectacular feline design. German-based company MiaCara, who originally produced only dog products, recently added a line of incredible modern cat furniture that is possibly some of the best I’ve seen. Most of MiaCara’s products are handcrafted in Germany and materials are also sourced locally whenever possible. They pay special attention to the functionality of each piece as well as the aesthetics, leaning toward an ultra modern look, but with lines that would look great in just about any home. The collection includes some distinctive cat climbing pieces. The Vista Cat Lounge, made from bent plywood, has a lovely mid-century modern look with scratching surfaces and wool hammocks for cats to enjoy. There are several new cat items on the MiaCara website that are coming soon with no information (other than some spectacular photos), including this modern cat tower that looks incredible. Another new item is the Torre Cat Scratching Post, a 2- or 3-level lounge with a similar shape as my own Palm Springs Lounge launched in 2011, but made from bent plywood with a wool scratching surface on one side. Also new, the Valto Scratch Panel is one of the most beautiful wall-mounted scratchers I’ve seen. It looks like a piece of modern art, with a replaceable felt scratch pad. The perfect size to hang wherever your cat prefers to scratch. There are several cat beds in the line including this new woven basket bed. The Covo Cat Lounge is another beautiful cat bed with a slanted opening that creates not just an attractive looking piece, but the perfect shape for cats to climb into and feel comfortable resting in. The Anello Cat Basket comes with a cozy faux fur blanket inside, creating pure heaven for cats. And three faux fur bucket beds look like the ultimate in luxury! There’s also a sneak peek at a new modern litter box hider. And don’t forget feeding time! The bent wood catBar Cat Feeder provides a sleek raised dining option for your cat. Items are available from MiaCara.com with prices ranging from €99 for some of the cat beds to over €600 for the climbing structures, plus shipping and taxes. International shipping is available. If you’re in the UK you can order several of the products from styletails.com. I will definitely keep an eye on this company to see what they add in the future, they are one of my new favorites! 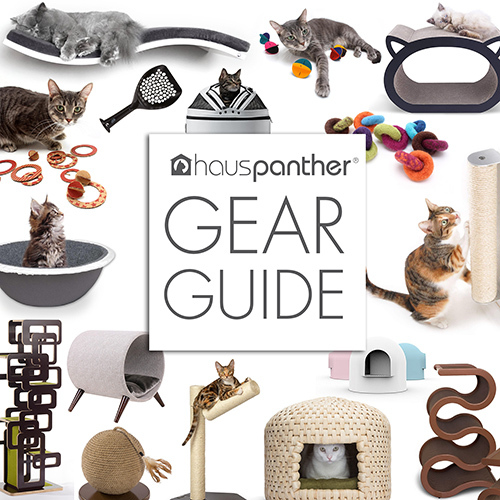 Modern Cat Tree from Pawhut – Great Style and Value! GORGEOUS designs. Beautiful models. And soft, soft faux fur! Love! Wish Australia has such great designs.